Do you love a good cup of black coffee, or perhaps a frequent glass of red wine? Those drinks and other substances can affect your teeth, leaving you with unflattering yellow or brownish stains. If you’re becoming uncomfortable with the way your teeth look, find out which options are available and learn about the benefits of laser teeth whitening in Singapore. Whitening toothpaste can help the colour of your teeth a little; but often, these types of toothpastes are too abrasive. They can actually make the problem worse in the long run by wearing away the enamel of your teeth and revealing the yellow dentin beneath. These kits can be complicated, and the process of using them is somewhat unpleasant. They have to be used regularly in order to effect any noticeable change, and most people give up before the solution actually achieves any significant difference. 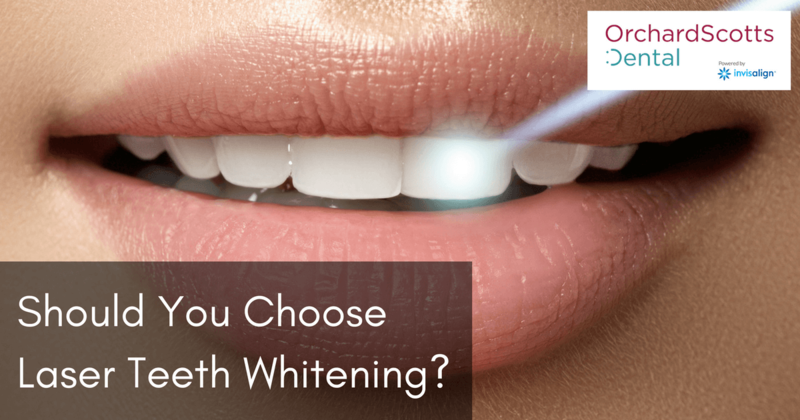 When you choose laser teeth whitening, the entire process is much easier and less time-consuming than using a home kit. Your dentist will fill customised trays with bleaching gel and use a laser to activate the gel, effectively bleaching your teeth. On your first visit, your Singapore dentist will take a mould of your mouth. He will use the mould to create personalised trays to contain the bleaching gel during your whitening procedure. For the next visit, you’ll relax in the chair while the dentist fills the customised trays with bleaching gel. He will insert them into your mouth, and you’ll wait while the laser activates and bleaches your teeth. If you have a sensitive gag reflex, you might have a little trouble while you’re sitting with the gel-filled trays in your mouth. Try raising one foot several centimetres off the chair and holding it there. The action helps with controlling that pesky gag reflex until the laser procedure is done. After the bleaching session, you’ll get up, take out the slimy trays, and get your first look at your newly bleached teeth. You should be able to see a significant difference right away. There are no significant side effects to laser teeth whitening. Some people may experience a small amount of sensitivity, but most people feel absolutely fine afterwards. Even for those who have sensitivity, the feeling fades quickly, and the resulting whiteness of their smile is worth it all. Your Singapore dentist will let you take the trays and gel home with you. You can continue treating your teeth with the bleaching gel for up to a few hours at a time. The more consistently you use the trays and the gel, the whiter your teeth will get. Just be sure that your methods allow you to achieve a natural-looking smile and not overdo it or use the bleaching gel excessively. Results of laser teeth whitening aren’t permanent. To help the results last longer, skip the fizzy drinks, black coffee, refined sugar, and red wine. Clean your teeth well with an electric toothbrush, and avoid smoking or other activities that cause staining. For more information about teeth whitening in Singapore, call Orchard Scotts Dental, and we will be more than happy to supply you with the information you need to whiten your teeth with us.